This is a very comfortable bed. I can finally fall a sleep on my back again. Made in the USA and certified by CertiPur, NRGel responds and adjusts to your body to provide optimal temperature control and invigorating supportive comfort. A unique combination of conformance and resilience, NRGel delivers a deeper, more restorative sleep so you feel refreshed and exhilarated when you awaken. In addition, NRGel maintains its resilience with changes in temperature. If it's cold or hot NRGel feels the same, unlike many memory foam products that get softer with heat and much firmer with cold air. 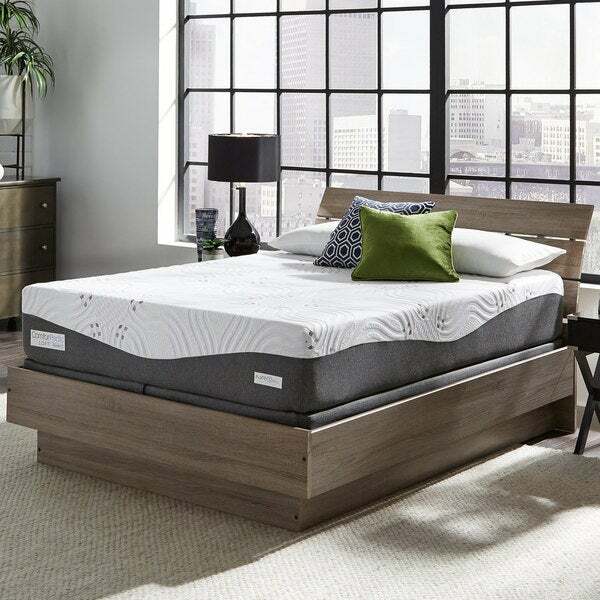 The ComforPedic Loft mattress features NRGel in the top layer, next to your body, so you get the maximum benefit. The stretchy knit fabric adds to the resilience to give you a wonderful night's sleep, free from aches and pains that affect your sleep. This mattress set includes the all wood foundation. It is easy to assemble and at 5.5 inches, will not make your bed too tall or cover up your headboard. I recently purchased this bed my teenage children, they have full size bunk beds, I was searching for something that was going to be comfortable, unlike the traditional bunkie type mattress that traditionally come with with bunk beds. My kids absolutely love the mattress, I purchased the medium firm and that was the best option! The bed also came with a loft frame that I can use later if needed!! I fully recommend this mattress set!! My cousin came to stay with me for a week and I had her sleeping in one of my spare bedrooms that had a daybed in it. Her back hurt and she wasn't getting good sleep. This mattress arrived 4 days after she got here I had her switch to this bed and she said it was SO much better. Her back didn't hurt and she slept all night . I highly recommend this mattress for the price. I bought this mattress to replace a traditional mattress and boxspring. I am beyond delighted with this set. It is amazing how much better I sleep now. Very impressed. Comfortable, great price.